New research shows that genetics may influence how quickly Alzheimer’s disease progresses among people with the late-onset form of the disease. Kauwe et al studied a sample of 361 people with late-onset Alzheimer’s and 358 similar-aged individuals who did not have the disease. They found that having two copies of an A rather than two copies of a G at a particular position in the genetic sequence accelerated the pace at which symptoms appeared. That location — the SNP rs3785883 — is located in the gene that encodes the tau, one of two proteins that accumulate in the brains of people with Alzheimer’s. Two characteristic changes are seen in the brains of Alzheimer’s patients. Plaques are sticky masses of a protein called amyloid-beta that form between neurons. Tangles are aggregates of the tau protein that form inside of neurons. Both plaques and tangles can be observed only during an autopsy. 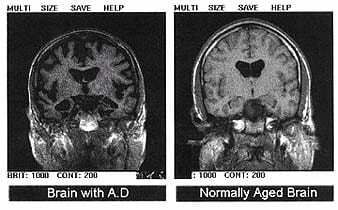 This makes a definitive diagnosis of Alzheimer’s disease difficult in living patients. But recent research has shown that the levels of amyloid-beta and tau in the cerebrospinal fluid (CSF) of patients can be used as markers for the disease. Kauwe et al originally examined a different group of 313 European Americans and found that the A version of rs3785883 is associated with increased levels of tau protein in the CSF, a sign of Alzheimer’s disease. The researchers then divided the sample of 313 individuals into two groups: those with normal levels of amyloid-beta in their CSF, and those with decreased levels. Lower — not higher — amyloid-beta in the CSF has been associated with the presence of plaques in the brain. The A version of rs3785883 was associated with increased tau protein levels only in those people who had decreased amyloid-beta in their CSF, the researchers reported Monday in a paper published online in the Proceedings of the National Academy of Sciences. These findings are what led the researchers to investigate the effects of rs3785883 on Alzheimer’s disease progression. The study’s authors suggest that rs3785883 does not influence whether someone will get Alzheimer’s disease, but instead it may influence the age at which symptoms appear. They propose that in people where the disease has already begun — as evidenced by lower amyloid-beta levels in the CSF — the A version of rs3785883 moves the disease along more quickly. It is important to note that rs3785883 does not appear to influence a person’s overall risk of getting Alzheimer’s. Also, rs3785883 was not associated with early-onset Alzheimer’s, which strikes before age 65. In the Kauwe et al study, even those people with two copies of the A version of rs3785883 (who developed Alzheimer’s disease earlier than those with two copies of the G version) had the late-onset form of the disease, which develops after age 65.